If you are a Dell Home shopper, and you are interested in the Yuneec Typhoon H RTF Drone with ST16, CG03+ and battery, in the new smaller box, you can purchase it for $740 with free shipping. Within twenty days of purchase, you will receive an email with a $150 promotional Dell gift card. The promotional amount must be spent at Dell Home within 90 days after it is sent to you. So in a way, you have to plan how to spend it if you are not a frequent Dell shopper. They have a variety of general purpose technology/computer accessories. Alexander S. White has written a lot of camera guides for various RAWsumers/serious-compacts and a number of his ebooks are currently on sale for $8 for the Kindle! You can find them all under his name. How useful these type of ebooks can be to you depends on many factors. For example, if you purchased every single Sony RX100 camera since they started coming out, you may have no need for the RX100 Mark V book. On the other hand, if the Sony RX-something is your first ever Sony digital camera, a camera guide can be helpful in getting you familiarized with the world of Sony. PS: you can find out at any time how much no-rush shipping digital credits you have by doing to amazon.com/norushcredits – it’s easy to remember, no rush credits. As far as I know, there’s no way to tell ahead of time whether an ebook is eligible or not for no-rush-credits. If you are planning an AdoramaPIX order and want it to arrive in the near term, the order deadline for processing before AdoramaPIX closes for the Passover holiday is Thursday 9am eastern. Print orders placed before that deadline will be processed before the company closes. The lab will be closed after that until April 6. 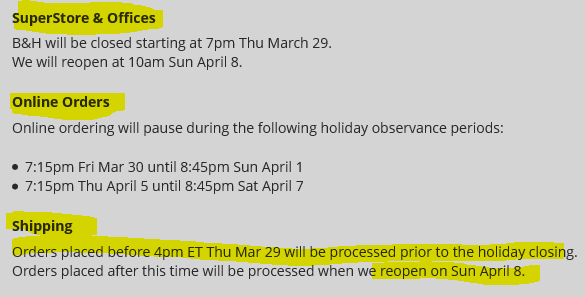 NOTE: Thursday 4pm eastern is the deadline if you want to place an order from B&H Photo and have it ship now, before they close for Passover!